Paint buttons with Mendocino Red and shade left side of each button with Black Cherry. Paint arms on using a liner brush with Autumn Brown. Paint nose with Georgia Clay. Use black Micron craft pen to add stitches and brown Micron craft pen to add stitches around the patches. Use white paint pen to write "snow place like home". Splatter completed painting with White using an old toothbrush. Float: Technique used for applying shading or highlighting. Also known as "sideloading." A flat or angular brush is usually used with one side loaded with paint and the other side loaded with water or extender. Splatter: A technique that involves flicking the paint off the hairs of a bristle brush or toothbrush with your nail to achieve a "speckled" or "fly-specked" appearance. 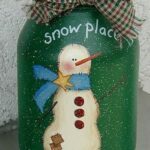 This project for Snow Place Like Home was printed from CraftsbyAmanda.com - https://craftsbyamanda.com/snowman-painted-jar-snow-place-like-home/ and can only be printed for education or personal use.